In his 33-year career as a football, gym, golf coach and golf instructor at the University of Arizona, Roy was actively involved in numerous programs to promote golf in Pima County. He started the PGA Junior Golf Program and founded and has directed the NCAA-recognized National Youth Sports Program for disadvantaged children. He also formed the Randolph Men’s Golf Club and actively participated in running various tournaments for the city of Tucson, including supervising the marshals at the Tucson Open. 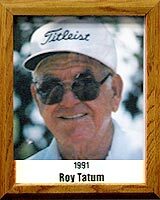 A true all-around competitor throughout high school in football, basketball, baseball, track and swimming, Roy was in charge of the only NCAA college men’s golf championship while coaching at the University of Arizona.